At 6.75 inches and only 60 grams, Flammulated Owls are one of the smallest owls in North America. Only Elf Owls (Micrathene whitneyi) are smaller. Other than females being somewhat larger than males, the sexes are extremely similar in appearance. The species has short ear tufts and an incomplete facial disk beginning at the ears and ending at the moustache. The eyes are dark. The wings are longer and more pointed in comparison to other species in the genus. The plumage of Flammulated Owls is gray with dark streaks and crossbars (McCallum 1994a). Also, some rufous coloration is visible, especially near the face and on the shoulders. It is unsure whether a distinct red phase exists. Flammulated Owls are usually heard more often than seen. The song of the male is described as a low-pitched, short, soft hoot like "poop" or "pooip" which is repeated every two to three seconds (Sibley 2000). Females are usually higher-pitched, longer in duration, and more quavering (McCallum 1994a). The dark eyes of Flammulated Owls distinguish them from any other North American owl of similar size. Also, their size and short ear tufts distinguish them from all North American Megascops species. Lastly, the low-pitched, soft, monosyllabic hoots will rule out any other forest owl in North America, except for Long-eared Owls (Asio otus). Flammulated Owls' small size, vocalization, eye color, and head/ear shape in combination are diagnostic. Flammulated Owls are apparently a neotropical migrant, at least in the northern part of their range, but migration patterns are poorly understood (Winter 1974, McCallum 1994a). No banded owl has been recovered outside the vicinity of the capture site (McCallum 1994b), but plausible evidence of migration is based on prey availability, empirical lack of torpor, long-distance vagrancy, and seasonal timing of observations (McCallum 1994a). Capture evidence from Arizona and New Mexico suggests they migrate at night; capture occurred from mid-April to mid-May in spring and over a longer span from early September to late October in fall (Balda et al. 1975). Winter distribution is south of the U.S. border and in Texas, Arizona, and California. In North America, spring arrivals mostly occur in late April and early May (McCallum 1994a). In several western U.S. states, they arrive generally in April and depart by the end of October (Voous and Cameron 1989). The species arrives in the breeding areas of central Colorado and Idaho in early May (Reynolds and Linkhart 1987b, Atkinson and Atkinson 1990). In Idaho, compilation of all distributional records showed the earliest date detected was March 30 and the latest was October 17 (Groves et al. 1997). 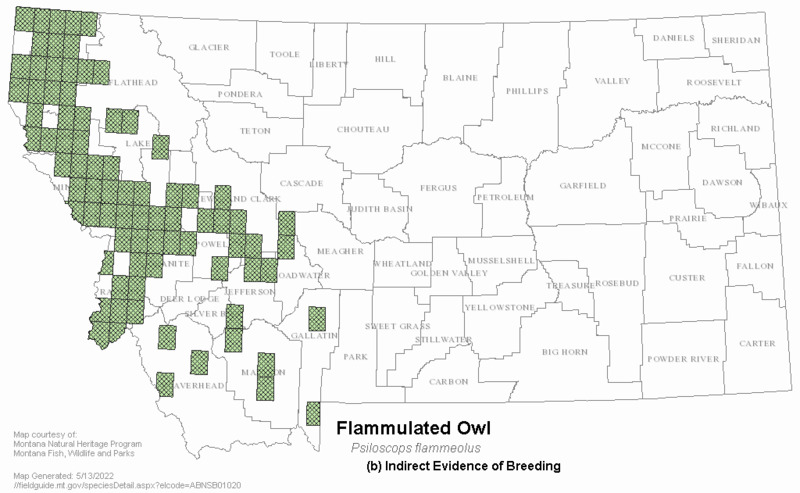 Flammulated Owls are present in British Columbia from late April to late September (Howie 1988, van Woudenberg 1999). Information on breeding habitat in Montana is limited to one study in the Bitterroot Valley (Wright 2000). In Montana, Flammulated Owls are associated with mature and old-growth xeric Ponderosa Pine/Douglas-fir stands (Holt and Hillis 1987, Wright et al. 1997) and in landscapes with higher proportions of suitable forest and forest with low to moderate canopy closure (Wright et al. 1997). They are absent from warm and humid pine forests and mesic Ponderosa Pine/Douglas-fir (McCallum 1994a, Wright et al. 1997). Information gathered from other studies throughout their range suggest the breeding habitat of Flammulated Owls is montane forest; usually open conifer forests containing pine, with some brush or saplings (typical of the physiognomy of pre-European settlement Ponderosa Pine forests). The species shows a strong preference for Ponderosa Pine (Pinus ponderosa) and Jeffrey Pine (P. jeffreyi) throughout its range (McCallum 1994b). They prefer mature growth with open canopy avoiding dense young stands. Flammulated Owls are found in a cooler, semi-arid climate, with a high abundance of nocturnal arthropod prey and some dense foliage for roosting (McCallum 1994a). Most often they are found on ridges and upper slopes (Bull et al. 1990, Groves et al. 1997). In British Columbia, Flammulated Owls use dry interior Douglas-fir (Pseudotsuga menziesii) where Ponderosa Pine may be a codominant, but pure Ponderosa Pine is avoided. Also sometimes they are in pure aspen and, locally, in spruce (Picea sp. )/Douglas-fir and Lodgepole Pine (Pinus contorta)/Douglas-fir. They prefer forests dominated by trees more than 100 years old. The highest densities are found in 140 year-old to more than 200 year-old forests; owls were restricted to forests with multi-layered canopies with an abundance of large, well-spaced trees interspersed with grassy openings up to 2 hectares in size, and where cavity-bearing snags were "moderately common" (Howie and Ritcey 1987, van Woudenberg 1999). A study in the Kamloops area testing a habitat model in Douglas-fir/Ponderosa Pine found three variables to be significant predictors for occupied habitat: elevation (between 850 and 1,150 meters), age class (older stands), and canopy closure (40 to 50 percent) (Christie and van Woudenberg 1997). In Idaho, they are found mostly in mature stands of Ponderosa Pine, Douglas-fir, or mixtures of the two with relatively open canopies (Atkinson and Atkinson 1990), occasionally in stands of pure Douglas-fir or aspen where Ponderosa Pine is absent. Sixty-five percent of detections were on upper slopes or ridges. Tree densities were approximately 500 per hectare and the mean DBH (diameter at breast height) for all trees was 32 centimeters (Groves et al. 1997). One nest cavity, excavated by a Northern Flicker, was in a 6.5 meter tall, 34 cm dbh, Douglas-fir snag (Atkinson and Atkinson 1990). In northeast Oregon, nest trees were located in stands of old-growth Ponderosa Pine or mixed conifers near small clearings (Bull and Anderson 1978). In Colorado, they show strong preference for old-growth Ponderosa Pine and Douglas-fir, using older trees for foraging and singing (Reynolds and Linkhart 1992, Linkhart and Reynolds 1997). Territories consistently occupied by breeding pairs were those containing the largest portion (more than 75 percent) of old-growth (200 to 400 years), whereas territories occupied by unpaired males and rarely by breeding pairs contained 27 to 68 percent old-growth (Linkhart and Reynolds 1997). Aspen (Populus tremuloides) is often a component of nesting habitat in Colorado and Nevada (Reynolds and Linkhart 1987b, McCallum 1994b). In northern Utah, the species has successfully nested in nest boxes in montane deciduous forests dominated by aspen with some scattered firs (Marti 1997). Flammulated Owls prefer to forage in yellow pine and/or Douglas-fir, and these forest types apparently support a particular abundance of favored lepidopteron prey (McCallum 1994b). In Oregon, they forage in Ponderosa Pine and Douglas-fir types with low to medium stem density, but show particular preference for forest/grassland ecotones (Goggans 1986, cited in McCallum 1994b). In Colorado, they preferred to forage in old-growth (more than 200 years), which was related both to an abundance of lepidopteron prey and to the open crowns and park-like spacing of trees which allowed greater room to maneuver for the owls (Reynolds et al. 1989). The species may focus foraging in a few "intensive foraging areas" within the home range, averaging 1 hectare per range (Linkhart 1984, cited in McCallum 1994b). Flammulated Owls roost in dense vegetation and thickets that provide shade and protection from predators. They often roost close to trunks in fir or pine trees, or in cavities (McCallum 1994b, USDA Forest Service 1994). In Oregon, they use mixed coniferous forest rather than pure Ponderosa Pine (Goggans 1986, cited in McCallum 1994a). In Colorado, large Douglas-firs or pines with a spreading form are used (Linkhart 1984, cited in McCallum 1994a). They roost close to nests (20 to 25 meters) during the nestling stage and just before fledging, and farther away before and after (McCallum 1994a). In British Columbia, Flammulated Owls roosted in regenerating thickets of Douglas-fir (Howie and Ritcey 1987). Migration habitat is in wooded and open areas in lowlands and mountains, including riparian areas and breeding habitat (McCallum 1994a). No food habit data exists for Flammulated Owls in Montana. Information gathered from other areas of the species' range indicate Flammulated Owls mainly hunt at night and eat nocturnal arthropods (McCallum 1994a and 1994b). Marshall (1957) reported most hunting activity occurs at dawn and dusk. McCallum (1994a, 1994b) reported Flammulated Owls hunting exclusively at night. They feed on various insects (e.g., moths, beetles, grasshoppers, crickets, caterpillars) (McCallum 1994a, 1994b). Moths (especially Noctuidae and Geometridae) and beetles are especially important (Reynolds and Linkhart 1987b, Marshall 1957). They possibly respond to spruce budworm outbreaks (McCallum 1994b) and may occasionally eat small mammals or birds (Bull 1987, Holt 1996). Foraging tactics include hawk-gleaning, hawking, hover-gleaning, and drop-pouncing and they will also glean insects from trunks and branches (Reynolds and Linkhart 1987, Zeiner et al. 1990, USFS 1994). Flammulated Owls in Oregon and New Mexico mostly foraged along the interface between forest or woodland and grassland (McCallum et al. 1995). In New Mexico, sit-and-wait foraging occurred 3 to 50 meters from nests (McCallum et al. 1995). 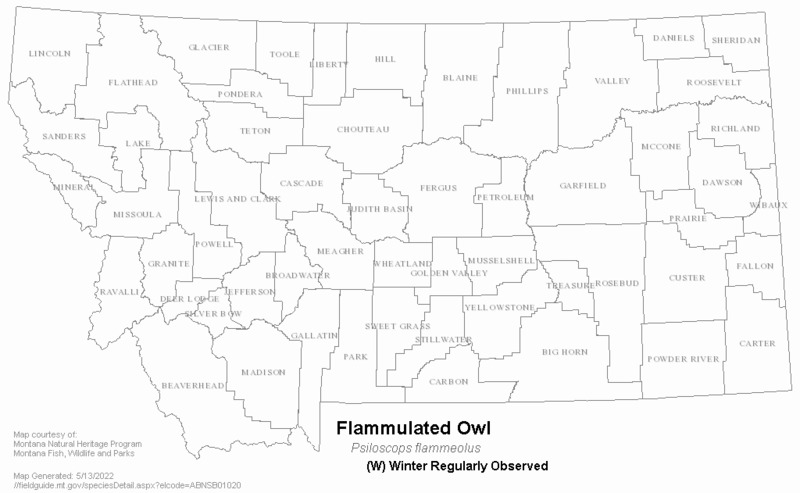 No ecological information regarding Flammulated Owls is available for Montana. In general, individual Flammulated Owls occupy the same breeding territory in successive years (Reynolds and Linkhart 1987a) with territory sizes about 5.2 square kilometers. Males show strong territorial fidelity but females may disperse to adjacent territories (dispersal distance averaged 474 meters) (Reynolds and Linkhart 1987a). This species may be semi-colonial (Atkinson and Atkinson 1990, Rodrick and Milner 1991), but this assumption is based solely on patterns of calling males and not on nest locations (Hayward and Verner 1994). Territory size usually remains the same from year to year, even if adjacent territories are unoccupied (McCallum 1994a). Territorial boundaries often occur along ridgetops (Reynolds 1987). Singing owls move widely within the home range. Male foraging, territorial defense, resting and day-roosting were confined to the home range in a Colorado study with home range sizes apparently influenced by canopy volume and range shape by topography (Linkhart 1984). Nesting home ranges vary from 5.5 to 24.0 hectares, and may diminish in size during the breeding season (McCallum 1994b). Home ranges diminished in Oregon from a mean of 15.9 hectares during incubation to 7.9 hectares during the nestling period, to 3.6 hectares during the fledgling period (Hayward and Verner 1994). In Colorado, territory size averaged 14 hectares with foraging activity concentrated in 1 to 4 areas within the home range (Reynolds and Linkhart 1987a). Both sexes make extra-range movements during the breeding season (Reynolds and Linkhart 1990). Flammulated Owl density in Oregon, British Columbia, and Colorado was generally fewer than 4 singing males per 40 hectares. Densities of singing males in Idaho averaged 0.41 per 40 hectares (Atkinson and Atkinson 1990), and in Oregon from 0.28 to 0.52 males per 40 hectares (Groves et al. 1997). Nests per 100 hectares averaged 2.9 in New Mexico, 2.1 in Colorado, and 1.4 in Oregon (not significantly different) (McCallum et al. 1995). In New Mexico, nest sites averaged 260 meters from the nearest neighbor (McCallum et al. 1995). Territories remain the same size in successive years and rarely expand when a neighbor is absent (Reynolds and Linkhart 1990). Recorded predators of adults include accipiters and Great Horned Owls (Bubo virginianus). Nest predation by Northern Flying Squirrels (Glaucomys sabrinus) has been documented (McCallum 1994b). Squirrels and other avian cavity nesters compete for nest cavities, and as Flammulated Owls come late to the breeding grounds, these competitors may limit nest site availability. No information specific to Montana is available, but other studies have found Flammulated Owls have low reproductive rates (McCallum 1994b). Clutch size is two to four (usually two to three) and incubation lasts 21 to 26 nights. In northeast Oregon, incubation ranged from June 8 to July 3; fledging occurred between July 25 and August 16 (Bull and Anderson 1978). Incubation is by females (male brings food). The nestling period is reported as 21 to 23 days. In Colorado, each of 5 broods averaging 2.8 young fledged over a 2-night period; young which fledged on the same night were associated into subgroups which separated on the 3rd night after fledging began; 1 parent attended each subgroup, and they dispersed in opposite directions (Hayward and Verner 1994). Fledglings are tended by both parents and are independent at about 1 month after fledging. Fledging occurs in July to August. In Idaho, the nest fledged between July 19 to 22 (Atkinson and Atkinson 1990). Brood size most often is two. The maximum recorded longevity in the wild is about 7 to 8 years (Reynolds and Linkhart 1990). The rates of nest success and productivity are generally unknown. No specific management activities for Flammulated Owls are currently occurring in Montana, however, management for old-growth ponderosa pine habitats is ongoing by a number of land management agencies. Management for the maintenance of this habitat type will be beneficial for Flammulated Owls in Montana. Atkinson, E. C. and M. L. Atkinson. 1990. 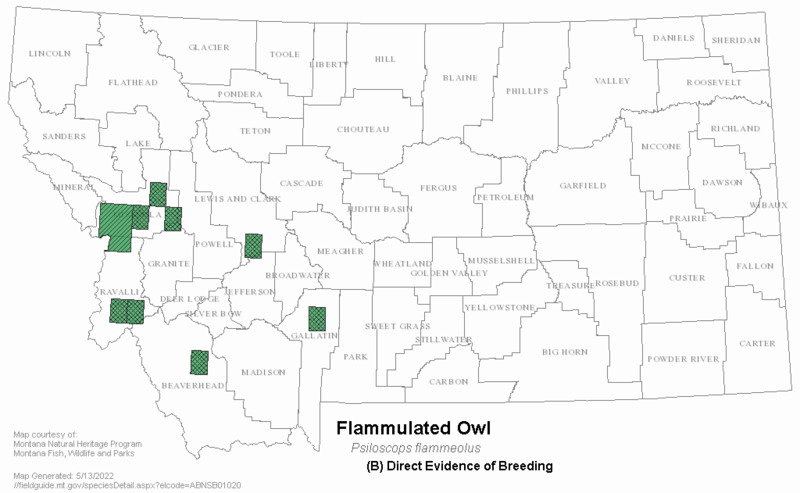 Distribution and status of flammulated owls (Otus flammeolus) on the Salmon National Forest. Idaho Natural Heritage Program, Idaho Department of Fish and Game, Salmon National Forest. Unpublished report. 25 pp. plus appendices. Balda, R.P., B.C. McKnight, and C.D. Johnson. 1975. Flammulated owl migration in the southwestern United States. Wilson Bulletin 87(4):520-533. Bull, E. L. and R. G. Anderson. 1978. 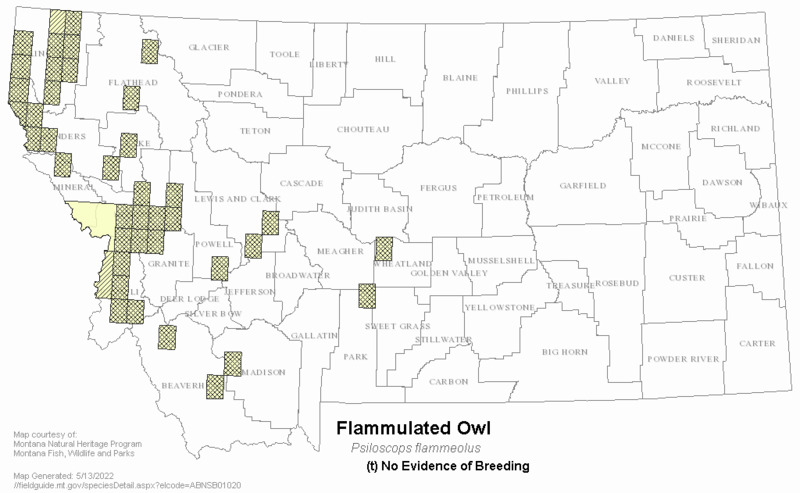 Notes on flammulated owls in northeastern Oregon. Murrelet 59:26-28. Bull, E. L., A. L. Wright, and M. G. Henjum. 1990. Nesting habitat of flammulated owls in Oregon. Journal of Raptor Research 24:52-55. Bull, E.L. 1987. Capture techniques for owls. In: R.W. Nero, R.J. Clark, R.J. Knapton, and R.H. Hamre, editors. Biology and conservation of northern forest owls. USDA Forest Service, General Technical Report RM-142. Pp 291-293. Goggans, R. 1986. Habitat use by flammulated owls in northeastern Oregon. M.S. thesis, Oregon State University, Corvallis. 54 pp. Groves, C., T. Frederick, G. Frederick, E. Atkinson, M. Atkinson, J. Shepard and G. Servheen. 1997. Density, distribution, and habitat of flammulated owls in Oregon. Great Basin Naturalist 57:116-123. Hayward, GD. and J. Verner. 1994. Flammulated, boreal, and great gray owls in the United States: A technical conservation assessment. Rocky Mountain Forest and Range Experiment Station, Fort Collins, Colorado. USDA Forest Service General Technical Report RM-253. Holt, D. W. 1996. On winter records and vertebrate prey in Flammulated Owls. Journal of Raptor Research 30:46-48. Howie, R.R. 1988. Status report on the flammulated owl, Otus flammeolus, in Canada. Committee on the Status of Endangered Wildlife in Canada. 58 pp. Linkhart, B. D. 1984. Range, activity, and habitat use by nesting flammulated owls in a Colorado ponderosa pine forest. M.S. thesis, Colorado State University, Fort Collins, CO.
Marshall, J. T. Jr. 1957. Birds of pine-oak woodland in southern Arizona and adjacent Mexico. Pacific Coast Avifauna No. 32. 125 pp. McCallum, D. A. 1994. Review of technical knowledge: Flammulated Owls. Pages 14-46 in Flammulated, Boreal, and Great Gray owls in the United States: A technical conservation assessment (G. D. Hayward and J. Verner, Eds.). U.S. Forest Service General Technical Report RM-253, Fort Collins, Colorado. McCallum, D. A., F. R. Gehlbach, and S. W. Webb. 1995. Life history and ecology of flammulated owls in a marginal New Mexico population. Wilson Bulletin 107:530-537. Reynolds, R. T., R. A. Ryder, and B. D. Linkhart. 1989. Small forest owls. In: National Wildlife Federation. Proceedings of the western raptor management symposium and workshop. National Wildlife Federation Scientific and Technical Series No.12. Washington, D.C. Pp 131-143. Reynolds, R.T. and B.D. Linkhart. 1987a. Fidelity to territory and mate in flammulated owls. Pp 234-238 In: R.W. Nero, R.J. Clark, R.J. Knapton, and R.H. Hamre, editors. Biology and conservation of northern forest owls. USDA Forest Service, General Technical Report RM-142. Reynolds, R.T. and B.D. Linkhart. 1987b. The nesting biology of flammulated owls in Colorado. Pp 239-248 In: R.W. Nero, R.J. Clark, R.J. Knapton, and R.H. Hamre, editors. Biology and conservation of northern forest owls. USDA Forest Service, General Technical Report RM-142. Reynolds, R.T., and B.D. Linkhart. 1990. Extra-pair copulation and extra-range movements in flammulated owls. Ornis Scandinavica 21:74-77. Rodrick, E. and R. Milner (eds). 1991. Management recommendations for Washington's priority habitats and species. Washington Department of Wildlife, Olympia. Unpublished Report. U.S. Forest Service. 1994. Neotropical Migratory Bird Reference Book. USDA Forest Service, Pacific Southwest Region. 832 pp. Van Woudenberg, A. M. 1999. 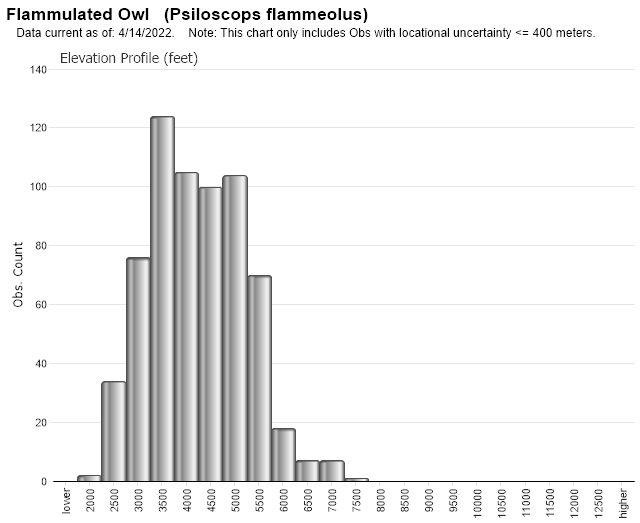 Status of the flammulated owl (Otus flammeolus) in British Columbia. Working Report No. 96, British Columbia Ministry of Environment, Lands, and Parks, Victoria, B.C. 45 pp. Voous, K. H. and A. Cameron. 1989. Owls of the northern hemisphere. MIT Press, Cambridge, Massachusetts. 320 pp. Winter, J. 1974. The distribution of the flammulated owl in California. Western Birds 5:25-44. Wright, V., S. J. Hejl, and R. L. Hutto. 1997. Conservation implications of a multi-scale study of Flammulated Owl (Otus flammeolus) habitat use in the Northern Rocky Mountains, USA. Pages 506-516 in Biology and conservation of owls of the Northern Hemisphere (J. R. Duncan, D. H. Johnson, and T. H. Nicholls, Eds.). U.S. Forest Service General Technical Report NC-190, St. Paul, Minnesota. Zeiner, D. C., W. F. Laudenslayer Jr., and K. E. Mayer (editors). 1990. California's Wildlife. Vol. 2. Birds. California Statewide Wildlife Habitat Relat. System, California. Resources Agency, Dept. Fish and Game, Sacramento, California. Bloom, P.H. 1983. Notes on the distribution and biology of the Flammulated Owl in California. West. Birds 14:49-52. Brelsford, M. 1992. Boreal owl (Aegolius funereus) and flammulated owl (Otus flammeolus) survey results for the Livingston district of the Gallatin National Forest. Unpublished report to the Gallatin National Forest by the Montana Natural Heritage Program, Helena, MT. 22 pp. Contreras-Balderas, A.J. 1992. Second record of the Flammulated Owl in Nuevo Leon, Mexico. Wilson Bulletin 104(2):375. Hayward, G. 1986. Activity Pattern of a Pair of Nesting Flammulated Owls (Otus flammeolus) in Idaho. Northwest Sci., 60(3):141-144. Holt, D. W., J. A. Hoy, and P. L. Wright. 1987. Occurrence and first nest record of Flammulated Owls in Montana. Journal of Raptor Research 21(3):120-121. Illg, C. and G. Illg. 1994. The ponderosa and the flammulated. American Forests 100:36-37. Marcot, B.G. and R. Hill. 1980. Flammulated Owls in northwestern California. West. Birds 11:141-149. Marshall, J.T. 1939. Territorial behavior of the flammulated screech owl. Condor 41:71-78. McCallum, D. A. 1996. Diurnal sight records of flammulated owls and possible vertebrate prey in winter: the case for caution. Journal of Raptor Research 30:49-51. McCallum, D. A. and F. R. Gehlbach. 1988. Nest-site preferences of Flammulated Owls in western New Mexico. Condor 90:653-661. Moore, T.L and G.P. Frederick 1991. 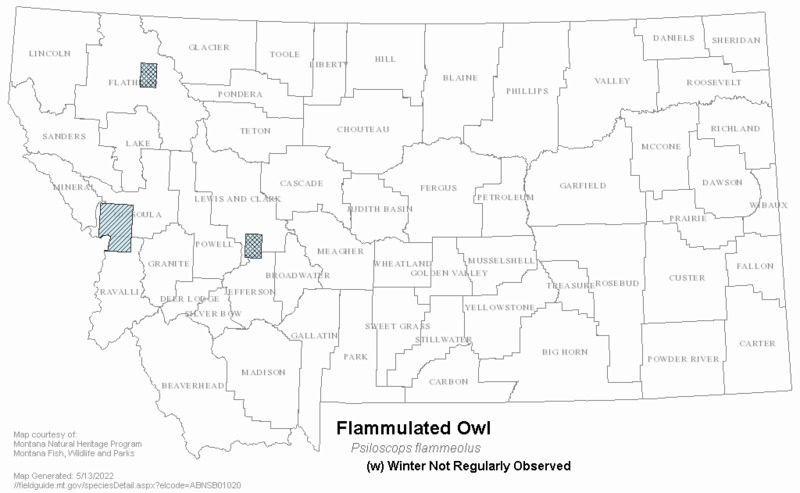 Distribution and habitat of Flammulated Owls (Otus flammeolus ) in west-central Idaho. Coop. Challenge Cost Share Proj . Payette Natl. For., Wallowa- Whitman Natl. For., and Id. Dept. Fish Game. Reynolds, R. T. and B. D. Linkhart. 1984. Methods and materials for capturing and monitoring flammulated owls. Great Basin Nat. 44:49-51. Reynolds, R.T. 1987. Census of flammulated owls. Pages 308-309 in R.W. Nero, R.J. Clark, R.J. Knapton, and R.H. Hamre, editors. Biology and conservation of northern forest owls. USDA Forest Service, Gen. Tech. Rep. RM-142. Reynolds, R.T. and Linkhart. 1987. Nesting biology of flammulated owls. Pages 234-238 in Biology and conservation of northern forest owls: symposium proceedings. U.S. Dept. Agric., For. Serv. Gen. Tech. Rep. RM-142. Reynolds, R.T., and B.D. Linkhart. 1998. Flammulated Owl (Otus flammeolus). Pages 140-144 in R. L. Glinski, Editor. Raptors of Arizona, University of Tucson Press, Tucson, AZ. Richmond, M.L., L.R. DeWeese, and R.E. Pillmore. 1980. Brief observations on the breeding biology of the Flammulated Owl in Colorado. West. Birds 11:35-46. Verner, J. and A.S. Boss. 1980. California wildlife and their habitats: western Sierra Nevada. U. S. For. Serv. Gen Tech. Rep. PSW-37. Wright, V. 1996. Multi-scale analysis of Flammulated Owl habitat use: owl distribution, habitat management, and conservation. M.S. thesis, Univ. Montana, Missoula. 91 pp. Web Search Engines for Articles on "Flammulated Owl"